Emily Wilding Davison, Activist, Suffragist, and Martyr? The most well-known aspect of Emily Davison's life may be her death--on 4 June 1913, she stepped onto the track at the Epsom Derby, perhaps in an attempt to disrupt the race by reaching for the bridle of King George V's horse, Anmer. She collided with the horse, was trampled underfoot, and died four days later, on 8 June. Her act was controversial--or, rather, her intentions were unclear--and we'll come back to that in a bit. But, first, the life. 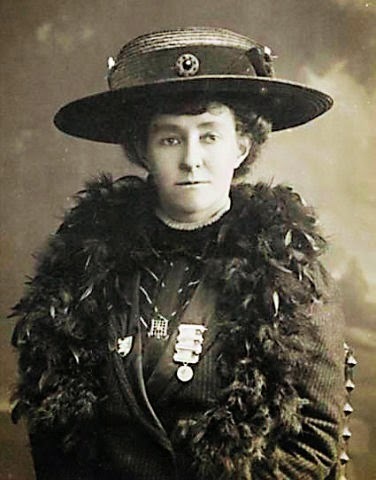 Born in London, Emily Davison attended Royal Holloway College, a women's college opened in 1886 (it would later become part of the University of London), but was forced to leave without a degree after a year because her father's death put the fees beyond her reach, despite the monetary award she had been granted upon acceptance. In 1906, Davison joined Emmeline Pankhurst's Women's Social and Political Union; by 1909, she had given up her teaching job and devoted herself to the suffrage campaign. She was arrested and imprisoned nine times for acts ranging from making a public disturbance to burning mailboxes. In 1909, for example, in Manchester, she was sentenced to one month of hard labor in Strangeways Prison for throwing rocks at David Lloyd George, then Chancellor of the Exchequer. She attempted a hunger strike, but after she barricaded herself into her cell, it was flooded by guards. "I had to hold on like grim death. The power of the water seemed terrific, and it was cold as ice," she later wrote. In 1912, during a six-month sentence in Holloway Prison, she and the other suffragist prisoners again went on a hunger strike. They were brutally force fed, and as an act of protest, Davison threw herself down a staircase, intending, she said, to call attention to the women's plight by her actions. She survived her prison term. But a year later, her life ended. What were her intentions when she stepped out onto the race track? And what were the implications of her death for the suffrage cause? As Germaine Greer notes, "The suffragettes made great theatre of Davison's funeral. The coffin was brought back to Victoria Station and taken in procession through streets lined with people to St George's, Bloomsbury." Some 6,000 women attended the service, while the streets were lined with people paying their respects. When she stepped out onto the race track, was Davison trying to bring down the horse, hoping to attach a suffragist sash to the horse, or just aiming to cross the track, intending to avoid the horses altogether? Was Davison's death an act of heroic martyrdom? Was it a deliberate self-sacrifice for the suffragist cause? Or was her vision of the race course obscured, her death a terrible accident? Was she a political activist or a social anarchist? Whatever her intentions, Davison's death did not result in a change in the suffrage laws. 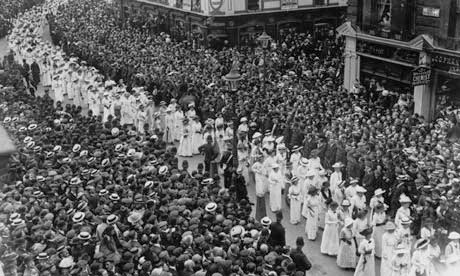 In August 1914, after the start of the first world war, both moderate and militant suffrage groups set aside their campaigns and worked toward the war effort. The vote would have to wait. For an excellent article on the recent "high-tech analysis" of the film of the 1913 race, see Vanessa Thorpe's "The Truth Behind the Death of Suffragist Emily Davison." For a nuanced analysis of the event itself, I recommend Germaine Greer's meditation, published on the occasion of the one-hundredth anniversary of Davison's death: "Emily Davison: Was She Really a Suffragette Martyr?" For more information, there is a wonderful online exhibition posted by the London School of Economics, which you can access by clicking here. You may also be interested in Carolyn P. Collette's In the Thick of the Fight: The Writing of Emily Wilding Davison, Militant Suffragette; it refocuses attention on Davison's life and work rather than celebrating or mythologizing her death. From the late 1870s, women had attended lectures, taken examinations, and had gained honours in those examinations. They were, however, unable to receive the degree to which, had they been men, their examinations would have entitled them. The new University statute of 1920 which admitted women to full membership of the University, and which came into effect from October that year, enabled women who had previously taken and gained honours in University examinations to return to matriculate (ie go through the formal ceremony of admission to the University) and have the degree to which they were now entitled conferred on them (again, at a formal ceremony). Consequently, at the very first ceremony at which women were able to graduate more than forty women did so. Update, February 2018: In honor of the centenary of some British women at last gaining the right to vote (the 1918 Representation of the People Act, 6 February 1918), the BBC's History Extra podcast has produced two excellent shows: "The Suffragettes" and "The Pankhursts." Enjoy!